The Davis Wine Aroma Wheel is divided into several sections to help you visualize the different flavors, scents and aromatic qualities found in most red and white wines, regardless of the grape variety. 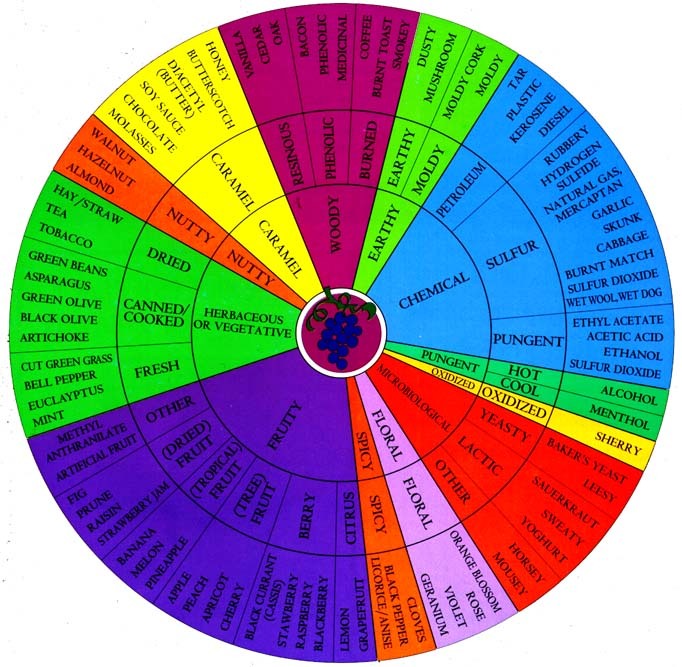 The same aromatic complexities and sensations pictured on the wine aroma wheel are found in red and white wines all over the world, from Bordeaux, to California and the Rhone Valley, as well as every other viticultural area. In young wines, initially tasters will experience what is known as primary aromas. These early scents come predominantly from the fruits, which include notes of berries, grape, cherry, strawberry, boysenberry, cassis, blueberry, blackberry and black cherry in red wines. In white wines, the early aromatic qualities most often expressed range from citrus top apple, pear, pineapple or other tropical fruits. Young wines often offer coffee, vanilla or chocolate notes from the oak, as well as floral, stone, licorice and jammy scents. With time and bottle age, wines develop secondary or tertiary qualities which add layers of depth and complexity a wines bouquet. Some of the more easily recognizable tertiary aromas include tobacco, truffle, earth, spice box, chocolate, smoke, crushed stone and cigar box. These secondary qualities are prized as only the worlds’ best wines are capable of aging and developing these additional layers of complexity.